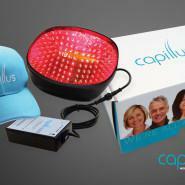 Capillus is a cohesive approach for hair loss managed by a physician. Capillus is a non-surgical option for both men and women who battle hair loss. The device uses a combination of hair loss therapies, including the science of photomedicine, which has been used for years in various fields of medicine, for the treatment of hair loss. Laser therapy can be used alongside your hair restoration professional's methods of hair loss treatment, including topical solutions, prescription medication, and even hair transplants. Use the Capillus for 30 minutes three times a week at home or work. Dr. McMullen recommends it to patients with moderate hair loss to stimulate hair growth and encourage regrowth, or as a complement for hair transplant patients as a way to provide maintenance to the transplanted hair. It helps keep the transplanted hair stronger, preventing it from looking thinner over time. It also aims to keep the hair surrounding the transplanted hair strong. It also has been known to enhance the effect of the topical solutions.